Each staff person in Alumni Relations has their own group of alumni constituents—Kiera handles Penn Regional Clubs in the west, Nicole works with multicultural and LGBT alumni…you get the idea. My niche is simple: if an alumnus is over 65, I take care of that person. These alumni attended Penn before the Ivy League existed; they remember Locust Walk when it was still a busy street. I have heard such wonderful stories… Franklin Reinauer W’38 told me how the fellows would wear white tie and tails to elegant formal dances like the “Ivy Ball.” Bernie Lemonick W’51 told me that Franklin Field would fill with 80,000 fans to cheer Penn’s nationally-ranked football team. 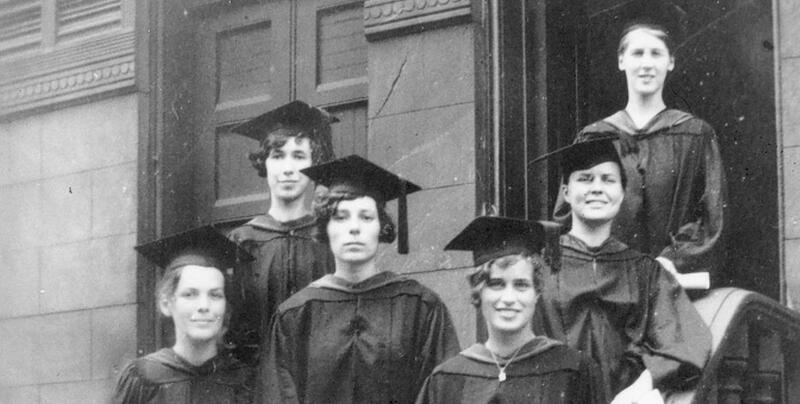 Mildred Kunzig Keil CW’44 shared that her classmate and friend was paralyzed by polio right after graduation, and that she and her Penn friends had lunch and played bridge with her once every month for 50 years afterward. Working with them is a privilege I cherish, because I have the opportunity to absorb their wisdom and filch a little of their inner peace. Many tell me that attending Penn was an opportunity for which they will always be thankful. They often speak of the approaching end of their lives with a serenity I admire, saying (with a twinkle) that they plan to be buried wearing a red and blue Penn tie, or that they hope someone sings “The Red and Blue” at their memorial service. At first I would brush off these remarks with the discomfort of youth – “you won’t need that tie for a long time!” – foolishly denying them acknowledgement of their loyalty. Now, I understand that it’s important to share their reflection on a life well-lived, and the role Penn played in that life. Now, I understand the obstacles they overcame. Now, I thank them for paving the way. If you would enjoy learning more about these inspiring alumni, explore these sites.